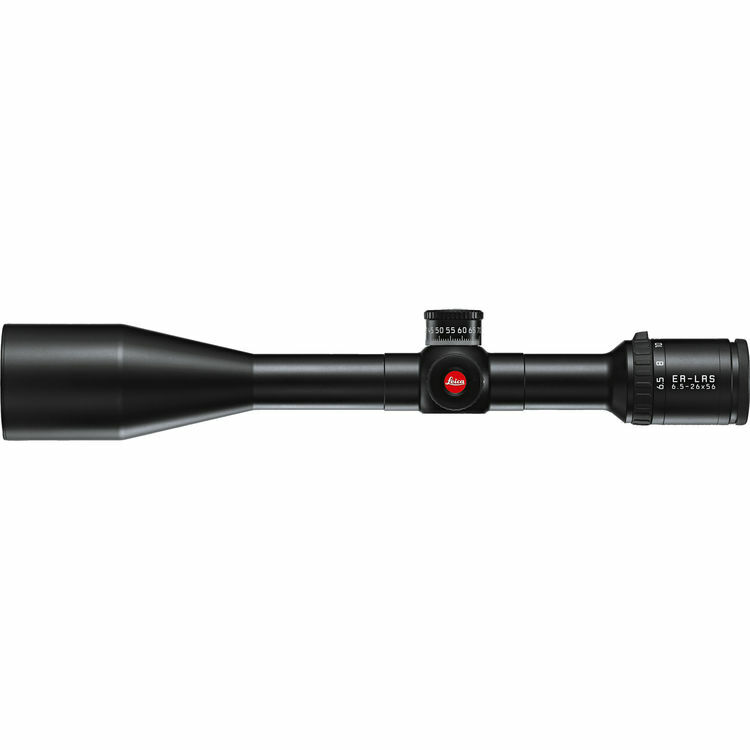 Optimized for marksmen and competitive shooters, the long-range ER 6.5-26×56 LRS Side Focus Riflescope from Leica features a wide objective lens, high contrast High Definition (HD) multicoated optics, and a 4x zoom. The 56mm objective provides maximum light gathering capacity in its class, which allows you to extend your hunting day and take shots at dawn or dusk. The brightness of images is further enhanced with multiple high quality dielectric anti-reflective coatings that provide transmission of light greater than 91%. With the additional AquaDura coating on the objective lens, you can simply wipe out the lens with a lens cloth without worrying about it getting wet or scratched. Aiming is parallax-free from 55 yards to infinity and the scope offers a 1/2 cm per click impact point correction, a 70 MOA windage, and a 120 cm elevation adjustments. 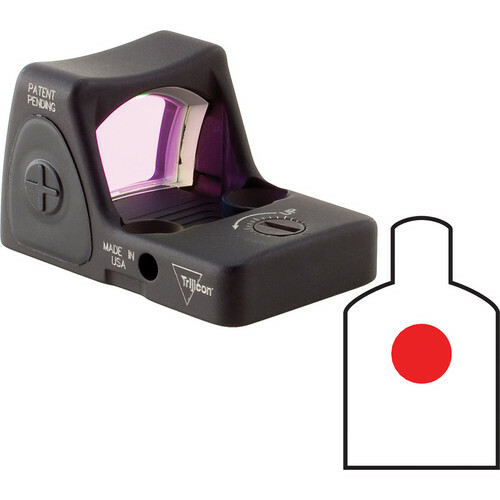 The side focus adjustment option helps you to adjust sharpness of the reticle without taking your eye off the target. Intended for modern center-fire cartridges, the Ballistic reticle is located in the second focal plane and will remain the same in size as you change the zoom factor on your scope. 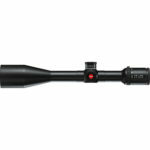 It is ideal for mountain or open plain big game hunting and varmint shooting. In addition, it allows you control to compensate for cross-winds with hold-offs for 10 and 20 mph. The durable matte black housing is made of single-piece high-grade aluminum and features a 30mm main tube. It is nitrogen filled to provide fogproof and waterproof performance and is submersible to 13.1′. The knurled zoom ring has a low profile lever for fast one-finger zooming. Also included with the riflescope are a lens cloth, objective lens and eyepiece covers. The matte black RM07 RMR Reflex Sight from Trijicon provides optimum red-dot visibility against the target for rapid target acquisition and precise shot placement. Designed with longevity and repeatability in mind – the RMR (Ruggedized Mini Reflex) is waterproof to 65′ and features a durable aluminum housing with a scratch and corrosion-resistant hard-anodized finish, and hard-coated window to ensure long-term reliable service. 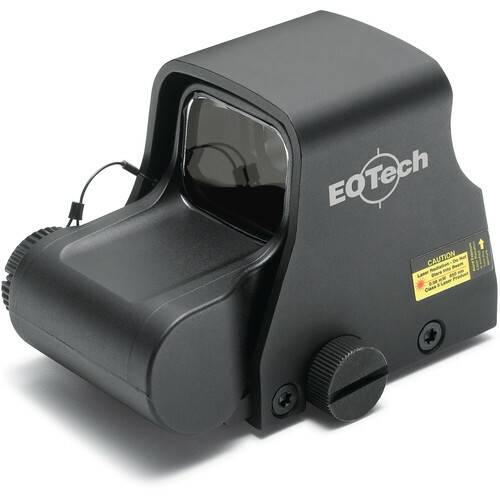 EOTech's Holographic Hybrid Sight II or HHS II EXPS3-4 HWS with G33.STS Magnifier bundles a compact and versatile holographic weapon sight with a 3x magnifier to increase the sight's usable range. The EXPS3 is built to conserve rail space while enabling rapid both-eyes-open sighting and tracking in a variety of conditions. This model's reticle features a 68 MOA outer ring with four 1 MOA aiming dots on the lower vertical axis that provides a center aiming dot for close range and convenient holdover dots allowing its use at medium and long range with the magnifier. The reticle has 30 brightness levels: 20 for daytime operations from dawn to dusk, and 10 additional settings that are compatible the Gen I/II/III night vision devices. The G33.STS magnifier provides a 3x power to increase the usable range of the sight and features the Switch-to-Side functionality which allows the user to move the magnifier to the side for close to mid-range use and quickly move it into place in front of the sight to engage and long-range. All this is done without having to remove the magnifier from the rail, for fast transitions. Both the sight and magnifier are submersible and come with integrated Picatinny/Weaver quick-release rail mounts for easy removal and re-mounting. 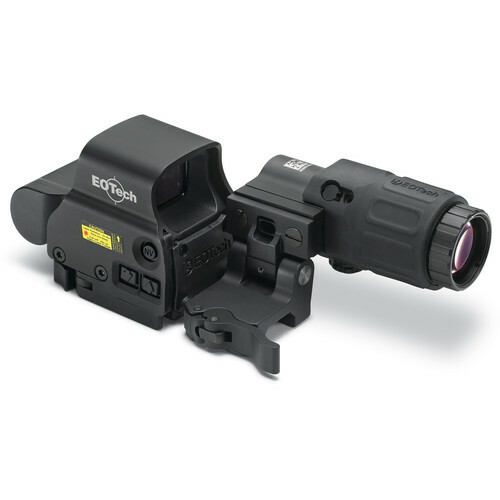 The 2015 edition of EOTech’s Model EXPS2 Holographic Weapon Sight is built to conserve valuable rail space while enabling rapid both-eyes-open sighting and tracking in a variety of conditions. This model’s reticle features a 68 MOA outer ring with a 1 MOA center aiming dot for use in close to medium range encounters with a second aiming dot under the first to use at longer ranges with magnifiers. To get users on target faster, impact point correction is made at 0.5 MOA per click with a total windage and elevation adjustment range of 40 MOA to compensate for most terrain and conditions. Measuring just 3.8″ and weighing a mere 11.2oz the EXPS2 has an integrated quick-release Picatinny/Weaver rail mount for fast and easy removal and reinstallation without having to re-zero, is submersible to 33′, and is internally fog-resistant. It runs on a single CR123 battery with a continuous runtime of about 600 hours at a medium setting, with 20 selectable intensity levels for use in most lighting conditions. 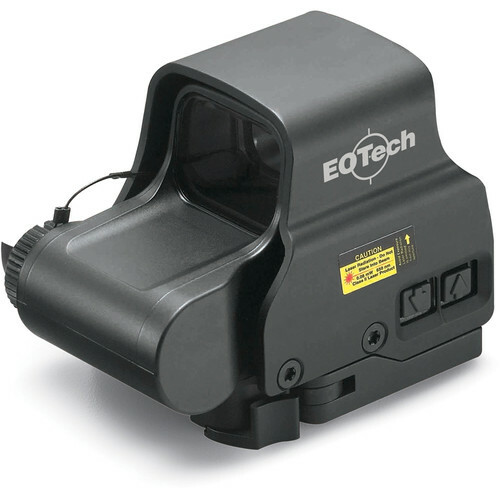 EOTech added a dual dot reticle option to the black Model 518 Holographic Weapon Sight (HWS) to compensate for bullet drop at longer distances. 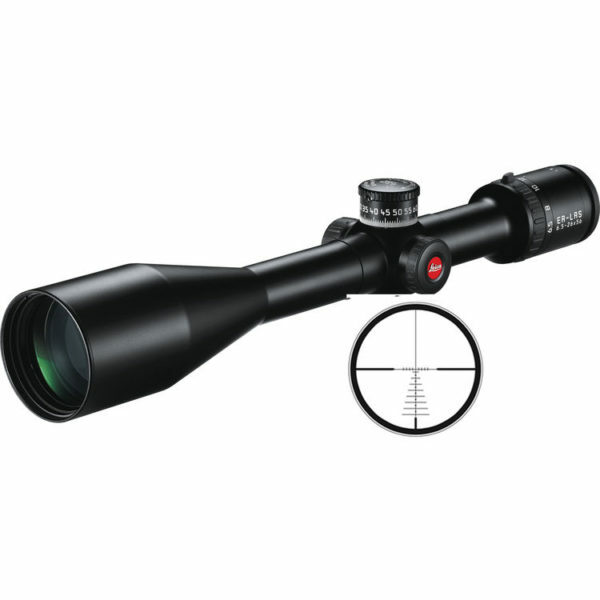 Designed to allow fast and easy target acquisition and tracking, with small to medium caliber platforms, it is also compatible with magnifiers to extend the sight’s reach for further accuracy. The 518 features an illuminated holographic red dot reticle, anti-reflection multi-coated optics, a 90′ field of view at 100 yards, and an unlimited eye relief to ensure that users maintain their situational awareness – especially when moving quickly. 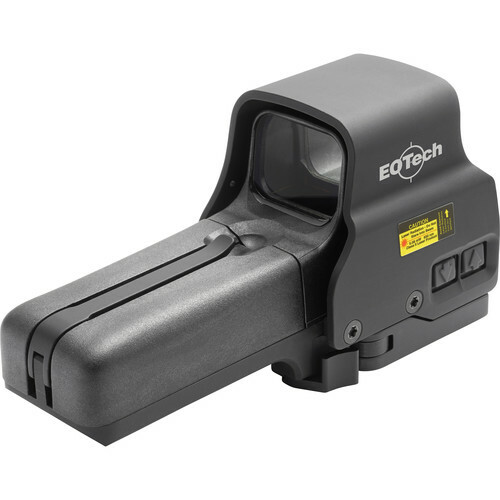 The 2015 edition of EOTech's Model XPS2 Holographic Weapon Sight is built to conserve valuable rail space while enabling rapid both-eyes-open sighting and tracking in a variety of conditions. This model's reticle features a 68 MOA outer ring with quadrant stadia, and a 1 MOA center aiming dot for use out to 200 yards, and a second 1 MOA aiming dot below it for easy holdover at 500 yards. To get users on target faster, impact point correction is made at 0.5 MOA per click with a total windage and elevation adjustment range of 40 MOA to compensate for most terrain and conditions. Measuring just 3.8″ and weighing a mere 9 oz the XPS2 has an integrated Picatinny/Weaver rail mount, is submersible to 10', and is internally fog-resistant. It runs on a single CR123 battery with a continuous runtime of about 600 hours at a medium setting, with 20 selectable intensity levels for use in most lighting conditions.